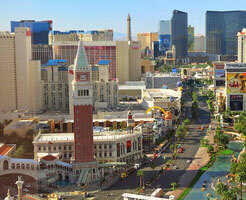 Why book Las Vegas Airport car rental at VIP Cars? Rent a car at Las Vegas Airport with pricing inclusive of CDW, Theft Waiver, Unlimited Mileage etc. 24x7 booking support via a toll-free helpline and live chat. A highly secure online payment system that accepts multiple currencies. Free cancellation for upto 48 hours before pickup. No extra or hidden charges at the time of picking up of the rental car. When you pre-book a car rental with VIP Cars, you get multiple options of hiring add-ons to customize your rental car for Las Vegas Airport according to your preferences and make your trip more organized and comfortable. These add-ons are available at a minimal surcharge and can be hired at the time of pre-booking or at the rental desk at the airport as well. Collision Damage Waiver - with this insurance, the customer is covered against any damage to the rental car upto a certain amount. The excess amount to be paid for the repair will depend on the damage caused to the vehicle and the supplier. Theft Waiver - the liability of the renter reduces with this insurance in case the rented vehicle is stolen. In the event of the vehicle not being recovered, an excess amount will be charged to the renter. Third Party Liability Insurance - this insurance covers the renter up to a certain amount in case some damage is caused to other people or property. The renter will have to pay an extra amount if the damage exceeds the value of insurance. *The inclusion and availability of these insurances vary from supplier to supplier. One way rental from Las Vegas Airport is possible but it solely depends on your car hire supplier. You are recommended to inquire and confirm the charges in case you are opting for a one-way rental as the drop-off charges depend on the distance. Rental car suppliers have their service desks at the McCarran Rent-a-Car Center which is located 3 miles from the airport. A free shuttle service runs between the airport and the car rental center every 5 minutes. The shuttle bus can be found near the baggage reclaim area in both terminals. Banks, ATMs and currency exchange desks throughout the airport. Over 1200 slot machines throughout the airport. Restaurants, cafes, bars and vending machines that serve quality food. Free Wi-Fi, internet kiosks, payphones and a post office. First-aid clinic, medical center, pharmacy, fitness area and massage rooms. A wide variety of retail stores including duty-free shopping in the International terminal. Business and conference facilities in the VIP lounges. Short-term, long-term and valet parking available. The airport is fully accessible to passengers with reduced mobility and the staff is also highly friendly and co-operative. When the renter lands at the Las Vegas Airport, he/she must have these documents handy, while picking up their rental car. These documents must also be carried by the renter at all times, while driving the vehicle. The confirmation voucher sent to the renter via email after the booking will have all the information about any additional documents, if required. The renter is also advised to provide his/her flight details and a valid phone number, while booking their rental car so that VIP Cars can keep a track in case of any changes or delays. Located just outside Las Vegas' southern limits, this 7 km long stretch of the best hotels and casinos is the first stop for any visitor. 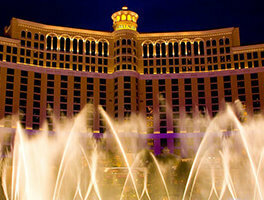 Inspired by Italian Town of Bellagio, Las Vegas' Bellagio remains one of the best casino resort hotels of Nevada. 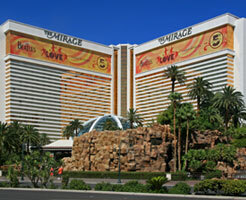 Boasting of the world's largest marquee, The Mirage is another plush casino hotel destination in Las Vegas. 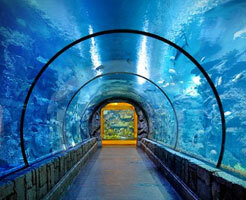 Shark Reef at Mandalay Bay: It is a public aquarium in The Mandalay Bay Resort in Las Vegas. The allowed blood-alcohol content is 0.08% but drunk driving should be avoided altogether as the Las Vegas police is very strict about catching drunk drivers. While Las Vegas itself never falls short of intriguing places that keep you entertained, you can definitely plan a great road trip beyond Las Vegas' boundaries. With so many amazing landscapes scattered in every direction that you may choose to drive to in your McCarran International Airport car hire, a road trip is certainly worth considering. One of the largest freshwater lakes of Nevada, Lake Mead is a perfect destination to relax amid cool breeze. Famous for its outdoor activities, Lake Mead offers plenty of water sports such as, boating, swimming, and skateboarding. Reach Boulder City within 40 minutes and make a small halt to discover the glorious past of such a majestic architectural marvel called The Hoover Dam. Refresh yourself at the Boulder Dam Brewing Company and drive over the road leading to the dam. One of the most popular ghost towns of Nevada, with abandoned vehicles, shopping store, and gas pumps, Eldorado Canyon is home to an old gold mine. A picture-perfect destination, the place is replete with best spots to click some shots. Wake up at the crack of dawn and start head-on with this epic road trip that passes through Nevada, Arizona, and finally reach Utah. As the desert blissfully turns into a greener meadow, you will find yourself surrounded by large trees, rocks, and magnificent waterfalls. You seriously need not think much when the road trip is about larger-than-life Grand Canyon. The trip to Southern Rim remains a popular choice due to stunning views and sky walk. Drive to the remote Northern Rim if geographic isolation is what you have been searching for. Don't let the Southern California go unexplored when you can actually hit the coastal roads in less than 5 hours. The Interstate 15 will pass through Baker, Barstow, a famous halting point to sip some coffee at the Starbucks, and then San Bernardino before finally letting you to drive into Los Angeles.